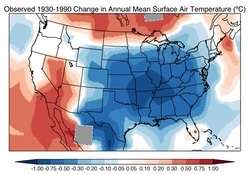 Study: aerosol pollution delayed warming in Eastern US. April 26, 2012. A team of scientists at the Harvard School of Engineering and Applied Sciences has discovered that particulate pollution over the eastern United States created a “warming hole” that delayed the onset of global warming in the late twentieth century. Unlike greenhouse gases, aerosol pollution has a very short lifespan, and its distribution across the earth is uneven. Until the Clean Air Act was passed in 1970 and strengthened in 1990, aerosol particles cloaked most of the central and eastern United States. Not only do aerosol particles reflect incoming sunlight, cooling surface temperatures, but they also act as nucleation sites for cloud droplets, exacerbating the cooling by reflecting even more light. The team, under lead author Eric Leibensperger, used pollution information derived from the GEOS-Chem model developed at Harvard, and compared it with climate data from NASA’s general circulation model (for a good book on modelling climate, read A Vast Machine by Paul Edwards). The findings, published in the journal Atmospheric Chemistry and Physics, reveal that while global temperatures increased by 0.8 degrees Celsius from 1906 to 2005, temperatures in the American “warming hole” decreased by nearly 1 degree Celsius between 1930 and 1990. As particulate pollution declined temperatures rose, and now approximate the global trend. The study, which has received substantial media attention, has several important implications. First, it highlights how different forms of pollution behave differently in the atmosphere, with potentially surprising consequences. Improving local air quality and mitigating some of the most directly destructive effects of one form of pollution ultimately worsened the influence of pollutants whose influence, while less direct, is potentially even more damaging. Second, the study suggests that developing countries like China, only now tightening pollution standards, could soon experience similar “catch-up” warming. Third, the conclusions raise the possibility that the popularity of global warming denial in the US may have been influenced by the reality – or at least the memory – of cooler weather.